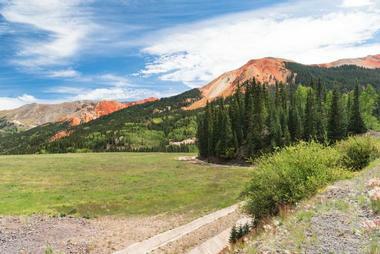 The small county of Ouray, located in southwest Colorado, has a population of barely more than a few thousand people. The small-town experience found in Ouray is very different from visiting a major US city like New York or Chicago, and even differs drastically from other cities in Colorado, like Denver or Boulder. But Ouray shines in its location, nestled right into the beautiful San Juan range of the Rocky Mountains, and provides a perfect jumping off point for any sort of natural exploration or adrenaline-seeking activities like ATVs, ice climbing, or off-roading. 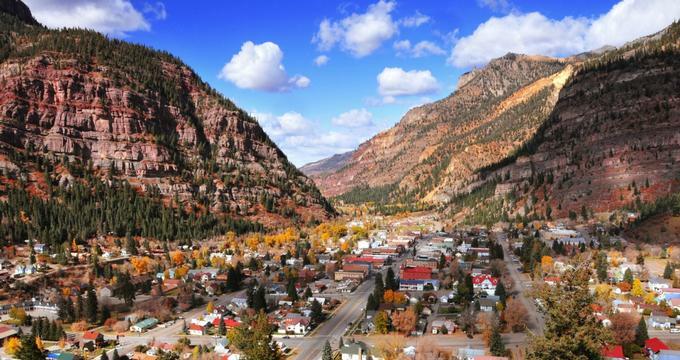 With hiking trails, old mines, ghost towns, waterfalls, and more, a trip to Ouray will provide visitors with some fascinating history in a stunning mountain setting. This ghost town, located about 12 miles from the town of Silverton, Colorado, was once a bustling mining community from about 1873 to the early 1920s. The town was home to almost 50 unique structures, including a saloon, a post office, and a general store. When the Gold Prince Mill was dismantled in 1917, the town's end was also near, and today, all that is left is a collection of old and abandoned buildings. Animas Forks is accessible by two-wheel-drive vehicles during the summer months, but cars with low clearance may have trouble accessing the ghost town. During the late 19th century, the Bachelor Syracuse Mine was one of the most prolific producers of gold. Today, visitors can explore parts of the old mine with a guide to show them the history and tell the stories of the men who once worked there. In the mine's stream, guests can also try their hand at panning for gold, and the lucky ones might just go home with a shiny new lump of precious metal. For those who get hungry, the cafe on the premises can serve up a delicious breakfast, which will provide all the energy that visitors need to be ready for all the activities offered at the mine. The Bear Creek Basin is home to a number of truly stunning hiking trails, many of which lead past or directly to historical buildings and mines. Hikers can choose the length of their trail, from the 4.5-mile round trip to Grizzly Bear Mine or the more strenuous 8-mile round trip on the Yellow Jacket Mine Trail. Both trails will lead hikers to old metal and wooden structures that were once used in the heyday of the gold mining industry in the region, with old carts, wheels, and other various tools left abandoned in the wilderness. The history of the mines, combined with the beauty of the mountain environment, make for a stunning hike. At Box Canyon Falls Park, visitors can explore the massive, sheer canyon and particularly the beautiful cascade formed by the narrowing of Canyon Creek. This waterfall has a drop of over 85 feet, with towering canyon walls that rise up on either side, and visitors will find a stunning view both from above and below the falls. 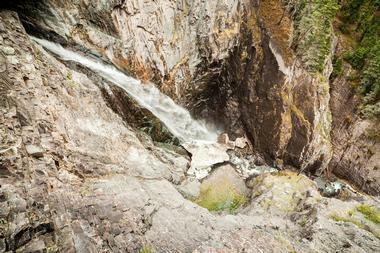 There are a number of trails that visitors can hike, each varying in difficulty. There is also a visitors center, where there are several interactive exhibits and displays regarding the flora, fauna, and geology of the park. As snow melts off the mountains, it gathers in a creek and flows down the slope of the Rockies. At Cascade Falls Park, this snowmelt results in a series of seven stunning cascades and waterfalls, which visitors can see and explore from the Lower Cascade Falls Trail. The trailhead begins quite close to town, at the end of 8th Ave, and is easily found by visitors. The trail is accessible for beginner or amateur hikers and is not long, but quite steep, and will lead hikers through the gorgeous red stone of the surrounding canyons and mountains to see the waterfalls. The Historic Western Hotel Restaurant and Saloon first opened its doors in 1891 and has been serving guests ever since. The three-story white building features twelve classic rooms and two suites with rustic decor, original molding, carved ceilings, leaded windows with stained glass, and other historical features. At the restaurant, guests can enjoy a drink at the original bar or savor a delicious meal on the open-air deck, complete with award-winning dessert options. The Historic Western Hotel is available for rental for events, weddings, and meetings and even as a film location. A city with so much history deserves the attention of its visitors, and with the Ouray Historical Walking Tour, guests to the region can walk its streets to put together pieces of the city's storied history. At the Ouray County Museum, visitors can pick up a free pamphlet that details tw24 points of historical interest, from old houses and shops to churches and hotels. Those who are unable to walk the self-guided tour can also view the sites while driving. The pamphlet gives a brief description of each of the sites on the list, but for more information, visitors can go to the Ouray County Museum, where the tour begins and ends. This Jeep Adventure Company is based right in the center of town, so visitors will have no problem finding Switzerland of America. As for exploring the mountains, the staff will take care of that. 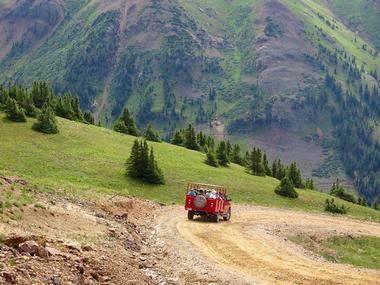 Guests can hop into the back of a custom Jeep for a half-day or full-day tour of the San Juan Mountain Range, which begins in the center of Ouray and travels out to Imogene Pass, the Corkscrew, Black Bear Pass, and more. Guides will teach guests along the way about the history of mining in the region, point out landmarks of interest, and tell stories of Ouray's past. 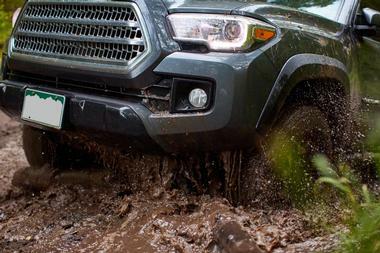 Guests can also choose to rent their own vehicles and explore the 500 miles of off-roading trails at their own pace. At Mouse's Chocolates and Coffee, they take serious pride in their work. Their products are coffee and chocolate, two delicious commodities that people are incredibly passionate about, and at Mouse's, only the finest ingredients are used. From the decadent Belgian truffles filled with nuts, ganache, and other fillings, to the antique roaster used to create the perfect coffee beans, Mouse's Chocolates and Coffee has got the craft down to a science, and with it they make art. The shop, which is open every day of the year except for Christmas, is open for customers from 9:00am to 7:00pm and offers treats, truffles, and coffee beans for everyone who enters its doors. The Ouray Alchemist Museum contains a breathtaking collection of historic medical and pharmaceutical artifacts. The items in the displays tend to focus mostly on the history of Colorado and the Wild West, but there are items in the collection from other areas, and even pieces that date back thousands of years, all the way to 350 BC. Guests should call ahead to book a tour, because the stories behind some of these artifacts, and the sheer knowledge of the guide, is unbelievable. There is a shop in front of the museum where visitors can view and buy some antique artifacts as well as collectibles, jewelry, old-fashioned candy, and plenty of other items that would once have been available in a Wild West general store. Colorado is a state that is well known for its prevalence in the craft beer scene, and Ouray is no exception. The Ouray Brewery is a brewpub and restaurant located right in the center of town, where guests can try some award-winning beers and enjoy a meal or a snack of freshly made delicious food. Beers are made in house with local ingredients, and many of them are named after places in Ouray and the San Juan Mountains. The staff is friendly and knowledgeable and always happy to share some of their beer knowledge or offer recommendations for pairings. At the Ouray County Museum, located in a historic building that was the St. Joseph's Miner's Hospital from 1886 to 1964, visitors can learn all about the storied history of Ouray County. There are almost 40 exhibits in the museum, pertaining to subjects like mining, railroads, and ranch life, as well as artifacts from original settlers and Native American tribes who once lived in the area. Visitors can also start the Ouray Historical Walking Tour from the museum with the help of an informational pamphlet offered at the front desk. One of the defining industries in Ouray's economic and cultural history is ranching, and at the Ouray County Ranch History Museum, guests can learn all about the families of settlers who worked their farms out here in the mountains. The museum's exhibits will teach visitors about the history of ranching in Ouray, as far back as the 1880s all the way to present day. Located on an old ranch, visitors will be able to explore to see how life was conducted on a historic ranch, with artifacts and tools on display. Admission to this fascinating museum is free, with a suggested donation. There are plenty of hot springs in Colorado, but in Ouray, visitors will find five hot springs that are sulfur free and enjoyable for a long soak. 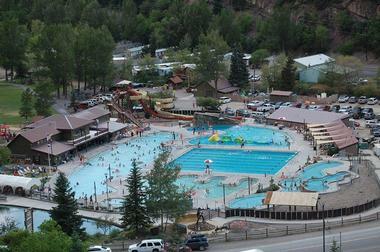 At Ouray Hot Springs Pool, guests can swim and lounge in a massive swimming pool fed by the hot spring, with temperatures that range from 88 to 105 degrees. At Wiesbaden Hot Springs Spa and Lodgings, visitors can swim and soak in the hot springs at the Vaporcave or enjoy a dip in a spring featuring a waterfall. Twin Peaks Lodge and Hot Springs also features a hot swimming pool and tub for soaking, and Box Canyon Lodge and Hot Springs offers terraced mineral hot tubs to guests of its establishment. Finally, there are the Orvis Hot Springs, which are naturally landscaped and lend an air of wild nature to the experience. Located in a spectacular natural gorge just outside the City of Ouray, Colorado, Ouray Ice Park is a man-made ice climbing site, home to over 200 ice and mixed climbs less than a 15-minute walk from the park entrance. The park is owned and managed by the City of Ouray, the non-for-profit organization Ouray Ice Park, Inc. and several private and public landowners. The park is a fun place to visit, whether you plan to have a heart-stopping day of climbing with friends, push your limits, or try it for the first time. 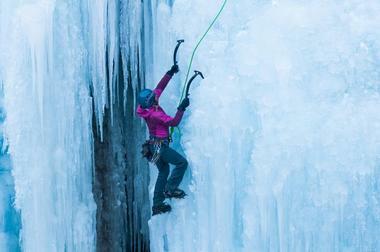 The park’s ice is created in November every year by a group of volunteers and staff who call themselves “the ice farmers,” transforming the breathtaking Uncompahgre Gorge into ice climbing cliffs by spraying the canyon walls with water using 250 sprinklers. 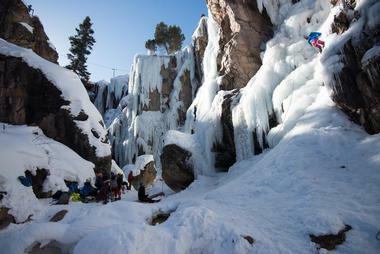 Ouray Ice Park has over 150 manmade ice and mixed climbs, 11 so-called distinct climbing areas, and about three miles of vertical terrain. Ouray is packed with lovely Victorian architecture and classic Wild West buildings, each with its own history. 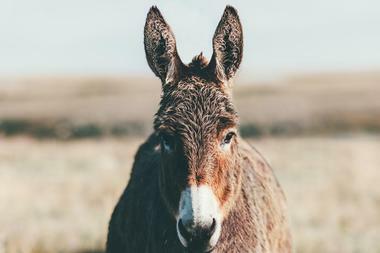 With the Ouray Mule and Carriage Company, visitors can learn some of that history while taking a ride around town in a large covered stagecoach pulled by mules. Prices are affordable, and the guides are incredibly friendly as they show their guests around town, telling stories and fun facts about each of the buildings they drive past. Visitors will love feeling like a part of history on the Ouray Mule and Carriage Company Tour. The Ridgway Area Trails, or the RAT as it is also known, is a system of trails that are a perfect paradise for mountain bikers. With hundreds of miles of different trails across various types of terrain, bikers can experience an epic ride on a single or double track through the stunning mountains of the San Juan range. Trails in the Ridgway Area Trail System range from the short 4-mile Portland Trail, which is pretty intense despite its short distance, all the way up to the Imogene Pass or Last Dollar Road Loop, an incredibly strenuous but beautiful trail that takes anywhere from 6 to 10 hours to complete, stretches for over 50 miles, and reaches heights of over 13,000 feet in elevation. 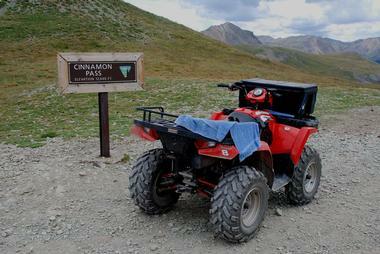 Seeing the Rocky Mountains from a car is one thing, but seeing them from the back of an ATV is another thing entirely. With the help of Ride-N ATV Adventures, visitors to Ouray can rent an ATV to see all the gorgeous mountain nature that Ouray has to offer. From a standard ATV, which seats one to two people, to a Side by Side RZR, which seats two or four and the five to six-seat Polaris Ranger, families and groups of friends have plenty of options when it comes to exploring the trails of Ouray. Rentals are available for a half day, either in the morning or the afternoon, or for a full day, and customers must be at least 25 years old with a valid driver's license to rent. Another lovely historic building in Ouray, the WrigOpera House was built in 1888. The lovely large hall, painted a creamy white with blue detailing and with large front windows that reflect the gorgeous nearby mountains, was once the center for music, performance art, and culture in Ouray, but it fell into disarray. 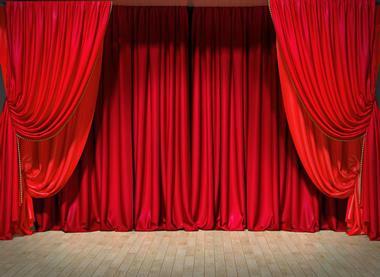 With the help of some dedicated local citizens, the Wright Opera House is getting a new lease on life, and with the ongoing restoration, will soon once again become a venue for music and stage performances, while still remaining true to the history of its past splendor. 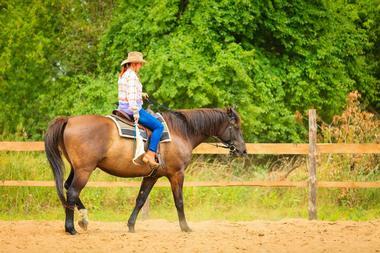 At Action Adventures Trail Rides, guests can see the Rocky Mountains from the back of a horse. 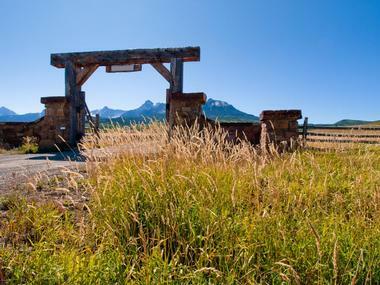 With a little help from the knowledgeable and experienced guides at Action Adventures, visitors can feel like they are part of the Wild West as they ride through the mountains, past herds of elk as well as waterfalls, rock formations, and more. Customers can choose from rides ranging from a 1, 2, or 4-hour trail ride all the way to an overnight trip, complete with campfires, cowboy coffee, s'mores, and tent camping in the vast, beautiful wilderness of Colorado. Prior horseback riding experience is not required. The trucks at Alpine Scenic Jeep Tours have individual bucket seats in the bed of the truck, each with their own heating and controls. Tours take place in custom modified 4x4 pickup trucks with PA systems, wind screens, and rain covers, among other features. Tour packages include options to lead visitors up to 13,000 feet in elevation, explore a number of hidden gems in the Ouray area, and see a huge variety of wildlife. Tours will splash through rivers, climb over boulders, and give guests the opportunity to view sweeping mountain vistas, all from the comfort of a truck. 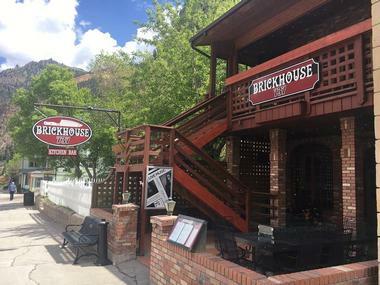 Brickhouse 737 is an American-style restaurant located in Ouray in a historic brick building that once housed the famous Pinon Restaurant as well as the Ivory Trading Company. The restaurant focuses on fresh food, with a farm-to-table approach and dishes inspired by food from all over the world. Brickhouse serves a variety of cleverly named and even more cleverly made cocktails as well as delicious dishes that all feel like they belong on the menu of a trendy Brooklyn bar. Brickhouse 737 is open all year round, 6 days a week, and is closed on Mondays during the winter season. KJ Wood Distillers is a labor of love from start to finish. Owner and distiller K John Wood had been making beer and wine for years when he decided to move into the field of distilling. Today, his liquors are made from top-quality mountain glacier water, local corn and barley, and the best imported juniper from Europe. His spirits include Berthoud Blue Vodka, Dead Drift Aged Whiskey, Ourye Rye Whiskey, and Jinn Gin. 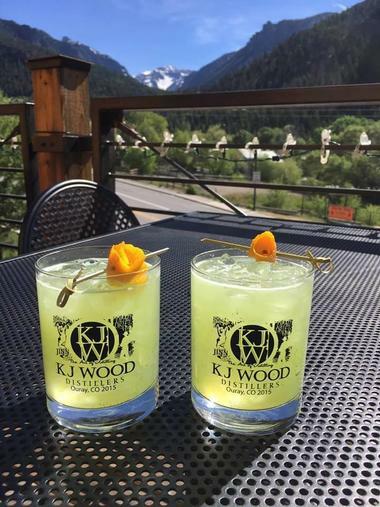 Guests are invited to enjoy these liquors, and cocktails made from them, at the KJ Wood Tasting Room, which is open Monday through Saturday from 3:00pm until 9:00pm. Ouray is world-famous for its canyons, gorges, and sheer rock walls, and there's no better way to get up close and personal with these stunning natural phenomena than with Canyoning Colorado. They offer tours for canyoneers of all levels, from those who have never done it before to those who can climb at an advanced level, and each tour is hosted by an experienced instructor who will guide guests in all aspects of the tour. Canyoning tours require participants to walk, swim, rappel, jump, climb, and scramble, so guests should be prepared to get a full workout.